Courtesy of Dafna Sonnenthal The Nature Bus, the creation of the Moss family, including Suzanne, Alaurah with puppy Bella, Phil, Mariah, Kevin and Gary, will pick up riders at the outdoor activity store REI at Pembroke Mall on Independence Boulevard in Virginia Beach. Suzanne Moss and her new business venture are all about imagination and relaxation, as it relates to nature or anything remotely connected to it. Ready to roll locally and across the state, The Nature Bus can take you to walks in the woods, to connections for camping or to yoga and meditation on the beach. For the more adventurous, think of white-water rafting, kayaking, canoeing or stand-up paddleboarding. Insect hunting, nature museums, berry-picking expeditions, farm tours and more — it’s all got Mother Nature in mind and heart. “The purpose of the bus is to connect people of all ages with all of the possible nature settings and nature experiences one can imagine,” said Moss, an advocate for the outdoors through her volunteer work with the Virginia Master Naturalist and Tidewater Junior Master Naturalist programs. She also lists elementary school teaching, yoga instruction, water safety training and wilderness first-aid lessons on her professional resume. To get The Nature Bus rolling, Moss began researching companies that sell buses, visiting those companies and learning about state and federal regulations for her venture. She ended up with a 2017 Blue Bird activity bus that seats 18 adults or 27 children, and features a full steel cage to enhance its safety. The bus has been undergoing an exterior makeover revealed to a select few. After Moss’ artist-son Kevin conceptualized a “wrap” for the bus, Virginia Beach naturalists and nature photographers Pam Monahan and Stuart McCausland provided images. Moss plans to drive the bus, having recently received a CDL, or commercial driver’s license. The bus can be used by all ages, and is available for group and school outings. Each nature trip will begin and end at the outdoor activity store REI at Pembroke Mall, where parking will be available. Moss is also using a room inside the store. When the bus begins its official road trips, Moss will be accompanied by a co-leader/naturalist who will narrate each special itinerary. “I will constantly be in search of individuals who may enjoy sharing their knowledge in a particular area of nature with others,” said Moss. Moss’ love of nature has long been woven into her family life. Her teenage daughter Mariah started a “nature club” when she was 5. Daughter Alaurah graduated from Duke University with a degree in environmental science and now works as a coastal scientist. Son Kevin, also a Master Naturalist, has spent countless hours helping her launch the business, while husband Gary assists with the business regulations and accounting. “The Nature Bus would not be possible without the whole family being so deeply involved in every aspect of this project,” she said. 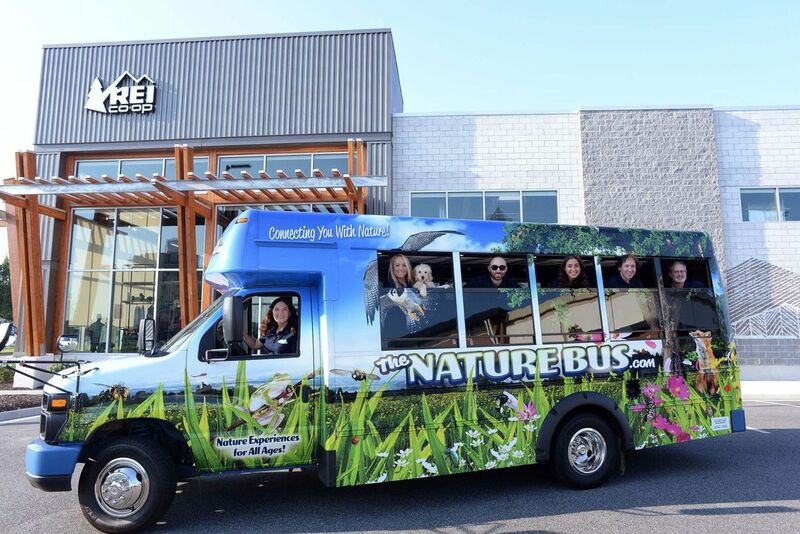 “The Nature Bus can offer an opportunity for people to make deeper connections with nature so they may grow more attached and perhaps develop more awareness and desire to get involved with protecting and preserving nature,” she said.